Whitening is a safe, non invasive way of improving the appearance of your teeth. Tooth whitening has been in use for more than 30 years and has been proven to be safe and effective. Impressions are taken of your the teeth and custom trays are made. You are then given a kit containing a whitening gel, which you load into the trays and wear for a few hours every night for a period of time. Usually the desired effect is achieved after 10 days. 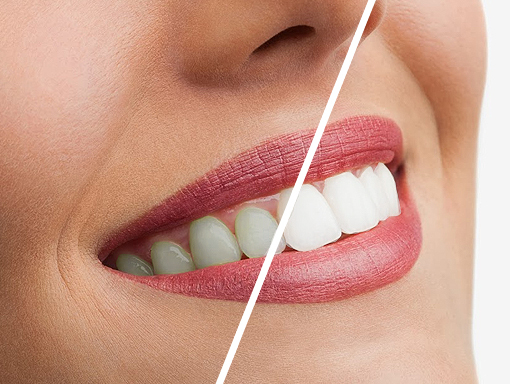 Whitening removes stains that are present and lightens the colour of your teeth, how long it lasts depends on whether you smoke and the amount of red wine or coffee that you drink. At any time you can “top up” by wearing your trays loaded with the whitening gel for a night or two. As long as the trays are looked after and there are no changes in your teeth the trays can be reused. Some people will experience sensitivity during whitening, but this will subside after a few days and can be decreased by simple steps such as using a desensitising toothpaste. As of October 2012 EU regulations state that tooth whitening products containing greater than 0.3 % Carbamide Peroxide may only be used under the professional supervision of a dental practitioner. Tooth whitening products containing more than 17% Carbamide Peroxide are no longer considered safe for use for general tooth whitening. Tooth whitening products containing more than 0.3% Carbamide Peroxide may not be used on persons under 18 years of age. We use a 10% Carbamide Peroxide gel.